GiGi's Playhouse is continuing with weekly sessions! There will be weekly session offerings for infants/toddlers, elementary age, and teens/adults. Interested in another program we are not currently offering? Take our programming interest survey!!! Learn more about these programs and RSVP for your spot. Thank you to all the families who participated in the Naperville St. Patrick’s Day parade. It was so much fun to be out in the community and spreading #generationG message! Thank you to everyone who came out to celebrate World Down Syndrome Day on March 21st! We had some learning activities about Down syndrome and had a great time socializing with families and celebrating. 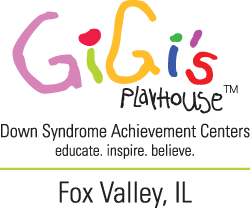 Introducing “Parent University” for GiGi’s Playhouse powered by Protected Tomorrows and presented by Mary Anne Ehlert, President and Founder of Protected Tomorrows. These are FREE presentations done online!! !